53% supported the principle of devolution while 16% expressed they opposed this. There was strong support for more decisions to be taken locally across a range of issues with a new housing strategy (82%), development of new homes (75%), creating a transport plan (77%) and road maintenance (85%) being the top 4. There was 52% support for a Mayor and 58% support for councils to come together as a Combined Authority. 29% opposed election of a Mayor and 25% opposed establishing a Combined Authority. 50.9% supported the principle of devolution while 38.7% expresses they opposed this. 54% supported the principle of devolution while 12% expressed they opposed this. Strong support for more decisions to be taken locally across a range of issues with decisions relating to road maintenance funding coming out on top. 59%supported councils joining together as a Combined Authority and 47% supportive of a mayor, with 27% opposed. Letters of support from business and the wider public and voluntary sector’s Business leaders with interests in Norfolk and Suffolk and leaders from the wider public and voluntary sector communities sent letters supporting devolution. Over 80 organisations endorsed a letter from the Norfolk and Suffolk Chambers and the LEP to Dr Andy Wood, the independent chair of the East Anglia Leaders’ Group, endorsing the devolution proposals as supporting the delivery of crucial projects to support economic growth, improve infrastructure and empowering the next generation with the skills to drive the economy. Many letters of support were received from the wider public sector and the voluntary sector including a number of higher education establishments, the University of East Anglia, the University of Suffolk, Clinical Commissioning groups, Visit East Anglia and Community Action Norfolk. Overall the consultation showed a strong desire to go ahead with devolution and I suspect that my Norfolk County Council group and South Norfolk Council will support the proposal to continue the process. I have received numerous complaints about the revised bus services particularly into the Poringland hub where users need to change buses. School transport has also come under scrutiny particularly through Thurton. The draft proposals have been submitted for the revised District Wards increasing the number of electors per Councillor to +-2556 (with up to a 10% variance) from 2165 for implementation at the 2019 elections. Brooke (includes Bergh Apton, Brooke, Kirstead, Mundham, Seething, Alpington with Yelverton) 2,707 1 2,707 6% This ward consists of a cluster of rural villages lying to the East of the A146, which will experience smaller scale growth. Includes joint Parish Council Alpington with Yelverton. This takes Alpington and Yelverton from the Rockland Ward. Rockland (includes Ashby St Mary, Carleton St Peter, Claxton, Thurton, Bramerton, Rockland St Mary with Hellington, Holverston, Rockland St Mary with Hellington, Surlingham) 2,630 1 2,630 3% This group of Parishes lie to the North of the District, and are primarily smaller villages which border the Broads Authority, with many connecting waterways. The Parishes also share a connection through the Thurton Group Benefice of 11 ecclesiastical parishes. Includes joint Parish Council Rockland St Mary with Hellington. This now includes Thurton and Claxton from the former Chedgrave and Thurton Ward. 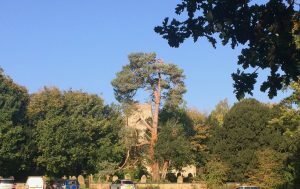 Members will consider measures which will allow the county council to effectively manage the implications of Chalara which is already affecting trees in Norfolk. These measures could include seeking financial support from Defra, and looking at how the county council can work with landowners to minimise costs to the authority Norfolk was one of the first areas in the country where Chalara was identified and councillors will hear how Norfolk is leading the way nationally in work to tackle the problem. Details of our methodology and early survey results were well received at the national Ash Dieback Safety Intervention Meeting organised by Defra, and national body the Tree Council, are now keen to share our methodology with other authorities in the country. The County Council has a responsibility to maintain the public highway and require owners of private trees to make safe dangerous trees in the interests of public safety. The current three year plan of work, will allow the county council to identify and assess the condition of ash trees adjacent to the County’s 6000 miles of roads and footpaths.